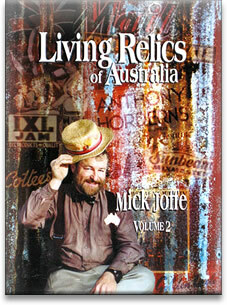 Living Relics of Australia by Mick Joffe Living relics contains 25 of our greatest living characters. This coffee table hard-cover book combines the very Australian art of caricature with oral history - the history of drovers, shearers, naturalists, miners, artists, explorers, etc. Their caricature captures them on the outside and their own words capture them on the inside. Only $29 + Postage Buy Now Online! I was running dog traps with my granddad. I was about 15 years old. He showed me the remains of an old hut at the head of Kings Arm Creek. He told me this was known as Connelly's Hut. Then he told me that Connelly claimed to be the man that made Ned Kelly's armour. Connelly had lived here for years and interfered with no one. Grandad told me that Connelly used to get his supplies from him. Connelly used to pay with small pieces of gold the size of a match head in a little bottle. I've seen it. It was in my grandparents' house for years. Connelly died about 1912 at his hut. He was found by Charlie Woodhouse who then rode to Grandad's. They gathered a few more men and went back to bury him. They dug a hole near the hut and rolled him in a blanket and dropped him in. Peter Pender, who had drunk the best part of a bottle of rum, thought they should say a few words like ?May he rest in peace.? But he smell got the better of him, so he finished the bottle of rum, threw the bottle in the hole and shouted ?Bugger it! Let him rip.? Then they gathered a few of his personal belongings, letters and books, put them in an old suitcase. They burnt down his hut. As we rode away Grndad said ?Connelly's real name was Dan Kelly but don't ever tell anyone?. Later my dad told me he could remember Connelly mainly came about at dark?. bit like a possum. It was like he was in hiding up there in Kings Arm Creek. Dad remembers Connelly coming to get his supplies about daybreak. As a kid he used to jump out of bed to try and get a look at him. He couldn't see much but remembers Connelly's voice was rough and sounded like a dog growling. This was all told to me when I was 15 or 16 (I was born in 1943) so it would be about 1958 or 1959. My Grandfather died in August 1961. He was 85. Connelly was a blacksmith and talk around here was always that Connelly had claimed that he was the one that made Ned Kelly's armour. The reason Grandad said don't tell anyone (that Connelly was really Dan Kelly) was that in those days you could be hung for harbouring bushrangers. Grandfather Tom showed me where Connelly's grave was I must have been the 1st one to be told. I marked the grave with a cross. I went with Bob Golby to where the hut was and found the grave. Bob died say 12 months later, about 1991. About 1992 I went back. I welded a bit of car spring on a 2 inch pipe like a cross and stamped 1912 into the pipe. A lot of people have found it since. I never put his name on it. Probably because of Grandad's wishes?.and anyway what name would you put on it? He's never been identified as either man. Connelly or Kelly and maybe he won't ever be. 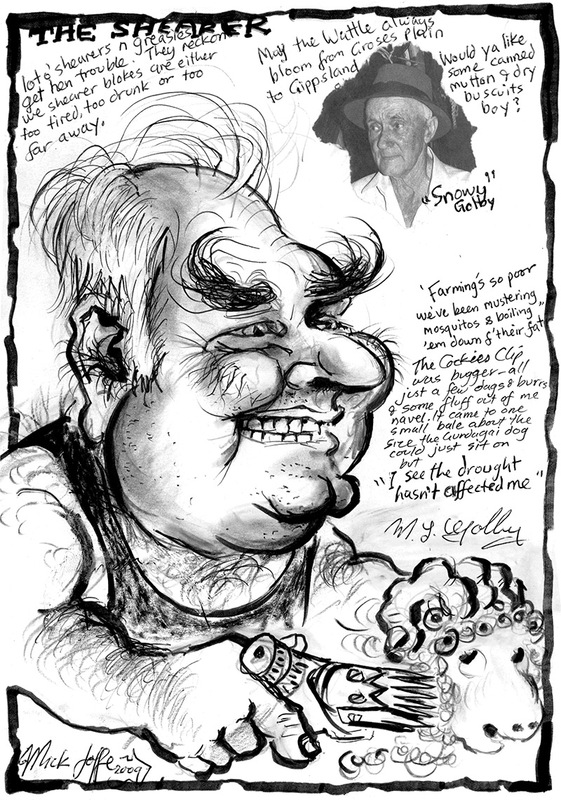 Since the early 1970s, Mick Joffe's passion has been to caricature and record endangered characters of Australia, and the world. As of 2015, the majority of these interviews exist only in manuscript form.